Patience. 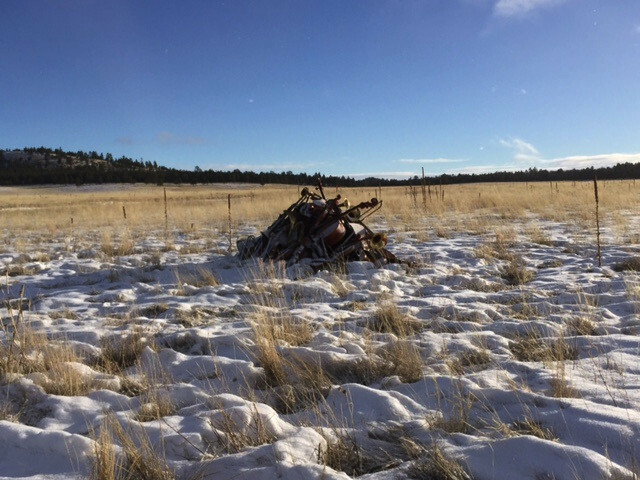 The pile of instruments seems to be positioned in the rain shadow of the San Francisco Peaks, a little haven of unwelcome sunshine in otherwise stormy northern Arizona. Revisiting the pile of instruments day after day, watching periodic flurries and waiting for snow, is becoming a ritual. Like the southern tradition of Sitting Up with the Dead, with loved ones and friends keeping vigil with the body until burial; or the Judaic custom of Sitting Shiva, the seven-day period of mourning and reflection following the funeral; spending time with the pile of instruments offers extensive reflection on the project and its varied meanings, and the intimate observation of this specific landscape. It’s easy to become frustrated with inaccurate weather predictions, only to remind myself that this lack of control over the circumstances, with nature driving the direction of the project, is a central theme. Waiting is integral to the process.